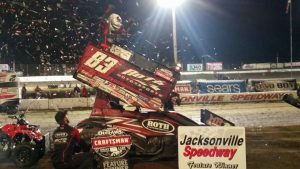 Jamie Veal’s top 10 Outlaw finish | Talking Speedway, Speedway news from around the world! 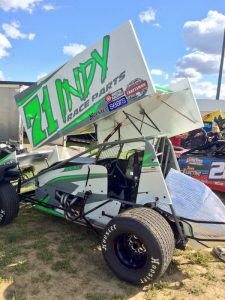 Jamie Veal’s US tour opener with the World of Outlaws and Indy Race Parts finished with a solid top 10 placing. Settling into the seat of his new race car the Indy Race parts with the unfamiliar #71 on the tail Veal settled in quickly as he pumped the gas and became one with the Jacksonville. Quarter mile, racy bullring during hot laps and qualifying. Qualifying strongly and facing a tough first up heat against Saldana, Stewart, Schatz and Gravel Veal finished a strong 3rd and gained automatic entry in the nights a main .A difficult night as illustrated by both Ian and Kerry Madsen finding them running the B main looking for the transfer spot. The Australian Champion Kerry Madsen still carrying the #29 in preference to the AU1 finished in 8th and missed a transfer to the A main. A seasoned campaigner in Australia up against the elite in World Sprintcar racing the nerves might have needed some settling down but once the #71 fired up and was pushed away the concentration and drive would have been completely focused on putting the Indy Race Parts #71 in the best possible position once the green flag was given to the 24 car field powered to the first corner. A top 10 Outlaw finish was an encouraging start to Veal’s US racing tour and to be the top finishing Australian would be very satisfying . 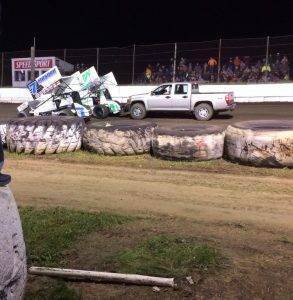 This entry was posted in Sprint Cars, The US Report, World of Outlaws Sprintcars by admin. Bookmark the permalink.